Cadillac has used the Academy Awards to launch “Dare Greatly”, an integrated advertising campaign marking a new era for the brand. “The Arena”, the commercial at the heart of the campaign, is set to President Theodore Roosevelt’s 1910 speech “Citizenship in a Republic”. 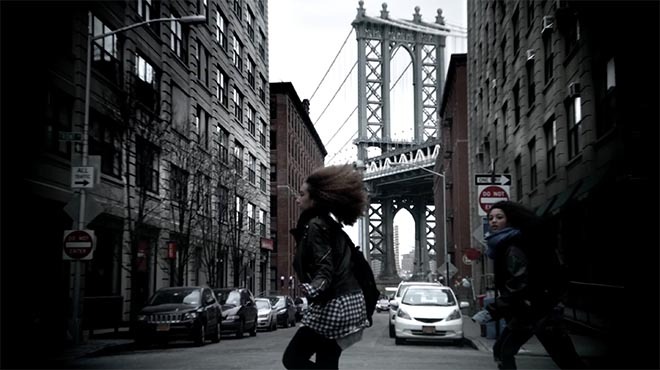 Filmed in New York City, the commercial provides a slow motion view of downtown life in the new home of Cadillac since the move from Detroit to New York City. 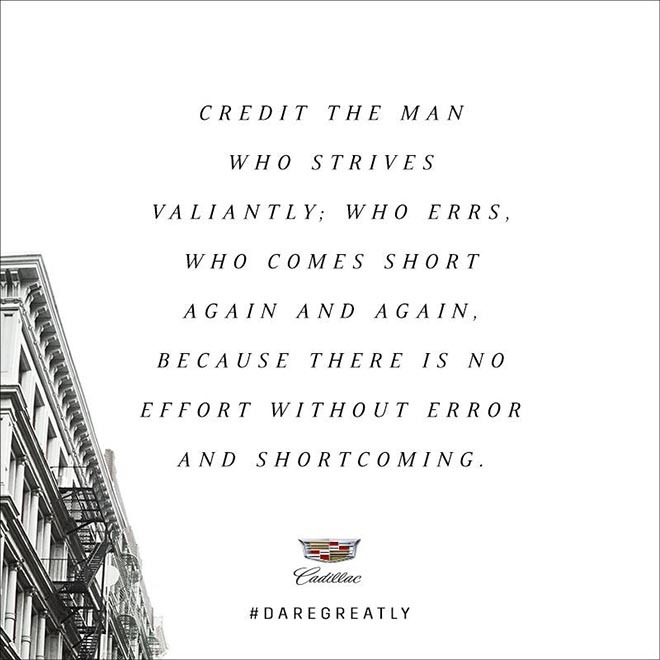 Cadillac’s Twitter channel and Facebook pages host a series of pics providing quotes from the speech beginning with “Credit the man…”, acknowledging Theodore Roosevelt. Cadillac built anticipation for the new ads by posting a five-minute video of a blank white-screen on YouTube on Feb. 12. 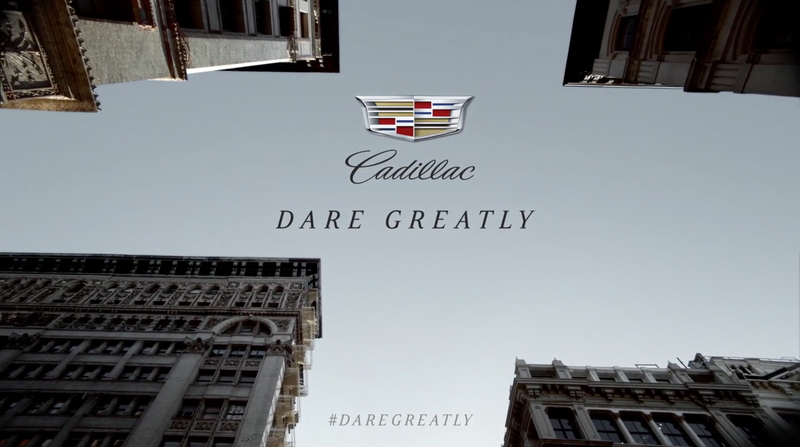 Its intent was to figuratively wipe the slate clean, as the brand revamps its social media platforms as well as Cadillac.com. 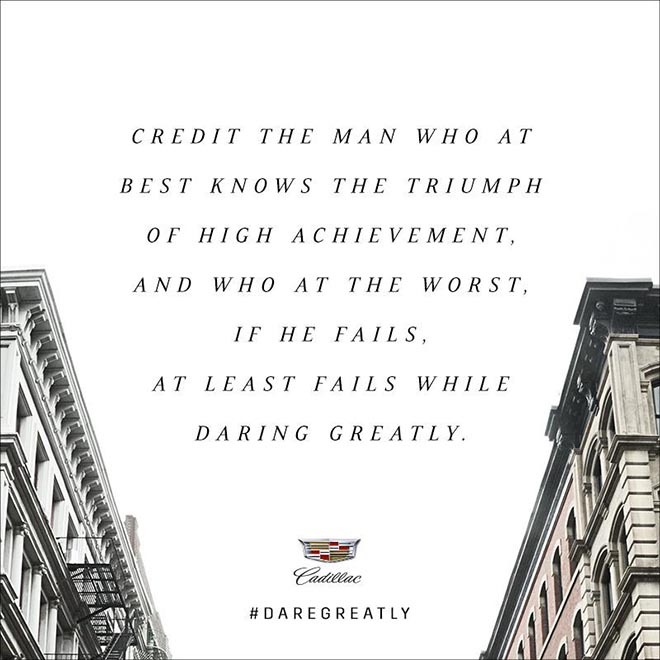 Bree Brown, author of Dare Greatly, a book on Theodore Roosevelt, was part of the inspiration for the Cadillac Dare Greatly campaign. She’s written a reflection on the campaign on her site. 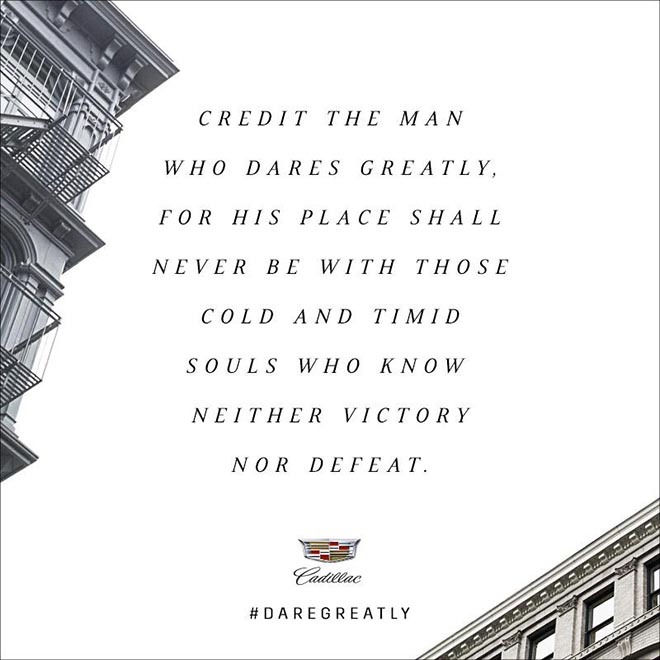 The Cadillac Dare Greatly campaign was developed at Publicis North America and Publicis London by executive creative director Andy Bird, creatives Kevin Colquhoun and Gregor Findlay, chief production officer Lisa Bifulco, executive producer Nikki Brancati, business manager Janet Wollman, music producer Theresa Notartomaso, global chief strategy and innovation officer Dylan Williams, chief strategy officer Carla Serrano, chief marketing officer Julie Levin, account executive Kristin Pulaski, strategy director Ben Zumsteg, strategist Anthony Harris, creative director of digital design Sabine Roehl, associate creative director Roman Tsukerman, chief digital officer Dawn Winchester, executive interactive producer Lissa Robinson. Sound was recorded and mixed at Sound Lounge by mixer Tom Jucarone and sound designer Hank Corwin. Visual effects were produced at The Mill by executive producer Melanie Wickham, producer Jason Bartnett, VFX lead Gavin Wellsman and VFX supervisor Hitesh Patel. Voice over is by Kimberly Dube.